Vol 1 | Issue 1 | July – Dec 2016 | Page 21-28 | Manish Agarwal. Department of Surgical Oncology P.D Hinduja Hospital & MRC Veer Savarkar Marg, Mahim, Mumbai 400016. Ullas, 1st floor 17 Laburnum Road, Gamdevi, Mumbai 400007. Introduction: Biopsy has a central role in diagnosis of musculoskeletal tumors. Inappropriately done biopsy is one of the most important causes of compromised limb salvage or worse loss of limb or life. It also has serious medicolegal implications. Problems can be avoided if principles and specially the technique of biopsy is understood clearly. This article focusses on basic principles and also provides easy guidelines for a biopsy. Key Words: Musculoskeletal tumors, needle biopsy, open biopsy, guidelines. A biopsy is perhaps the most important step in the workup of bone tumors. A histological diagnosis establishes the identity of the neoplasm before any treatment is offered. In a way it is like the final conclusive identification of the “criminal” where clinical and imaging clues help us narrow down the possibilities. We are living in a modern world where sarcomas have a cure rate of 60-70% and almost 90% of these are suitable for limb salvage. Most patients are first seen by a general orthopedic surgeon who then has the responsibility of establishing the diagnosis and guiding the patient to a correct specialized center for treatment. Inappropriately done biopsy is today the commonest cause of compromised limb salvage or worse, an amputation. (Fig. 1 & 2) This also opens the door to medicolegal dispute. Mankin  reported a 15.9% complication rate with 3% unnecessary amputations in his analysis of data of 597 patients from questionnaires sent to members of the musculoskeletal society. The purpose of this article is to address the common questions and provide easy guidelines for a biopsy. Very often, a clinician is confident of the diagnosis and wants to go ahead with the procedure assuming that the final histological diagnosis will confirm what was suspected. Even the patient is apprehensive about another intervention and a short delay till the biopsy report is available. It is risky to assume a diagnosis and carry out a final treatment without a biopsy confirmation. Fig 3 illustrates a case of a 11 year old girl whose tibial lesion was curetted on an assumption that it was a benign non ossifying fibroma. The final pathology was a high-grade osteosarcoma. This is a highly undesirable situation where extensive contamination has been caused in a sarcoma making limb salvage difficult and in some cases not possible. The above example is not rare. It is quiet common for a malignant tumor to mimic the imaging findings seen in a benign tumor. Another common error is to assume a diagnosis of chronic osteomyelitis and proceed with debridement without a biopsy only to find out later that it was a sarcoma.(Fig. 4) Therefore as a rule, irrespective of how typical the imaging is, a biopsy is a must before starting treatment or doing a curative procedure. It is best not to assume any tumor as benign without a biopsy confirmation. Fig 1 illustrates how an unplanned attempted excision for a presumed benign tumor resulted in an unnecessary amputation. Do all radiological lesions need a biopsy? Can a biopsy and final treatment be done in the same sitting using a frozen section? As a general rule, it is dangerous to carry out the final treatment on the basis of frozen section diagnosis and is not recommended. In certain conditions, the final treatment can be carried out at the same time as a biopsy; e.g. in a unicameral bone cysts(UBC), which are benign and have a characteristic appearance on x-ray, once the needle biopsy confirms the diagnosis(on frozen section), a steroid can be injected through the same needle. For Aneurysmal bone cysts, we recommend a biopsy as telangiectatic osteosarcoma can masquerade as an ABC.(Fig. 6). Here we recommend sclerotherapy only after a final biopsy report confirms the benign nature. In cases of a local recurrence or metastatic disease where the primary diagnosis is known, one may safely proceed with management after a frozen section confirms the diagnosis. Even in situation of metastases, in particular solitary metastases in the proximal femur, a primary tumor like a chondrosarcoma must be ruled out by a frozen section biopsy prior to final management. When should the biopsy be done? This statement by Jaffe  sums up the answer to the question posed above. The biopsy should be done only when all imaging studies have been completed. The optimum integration of clinical and radiographic information prior to biopsy has important implications for the diagnosis of bone tumors, and is necessary for accurate pathologic interpretation [3,4]. A surgeon must resist the temptation of getting to an instantaneous diagnosis by a hasty biopsy. In such a situation the pathologist has the most difficult task of giving a diagnosis purely from the microscopic appearance. This can be dangerous especially for the bone and soft tissue tumors, which are known to be extremely heterogeneous. The correct approach is to narrow down the differential diagnosis. The histopathology merely confirms the strongly suspected diagnosis. This is where the multidisciplinary cooperation between radiologist, clinician and the pathologist becomes vital. Prior imaging helps to narrow down the differential diagnosis by identifying fat, fluid, or mineral. Lesions like lipomas, and hemangiomas can be confidently identified by imaging, especially an MRI and may not require a formal biopsy prior to intervention. Imaging can also help identify the best areas to biopsy. The sclerotic, ossified, calcified or necrotic areas will not yield tissue for a diagnosis [Fig. 7] shows how an MRI helped identify the most suitable area for biopsy. Needle biopsy or Open biopsy ? Traditionally an open biopsy has been used. The tissue is obtained by an operative procedure which involves an incision into the tumor. The material obtained is generally adequate in quantity and less challenging to the skills of the pathologist. The matrix, cells as well as the architecture of cells can be studied and if necessary special tests can be done. The errors in diagnosis are therefore less. An open biopsy has to be scheduled as any other operative procedure. General anesthesia is usually required. It is therefore a more expensive affair than a needle biopsy, which is done as a percutaneous outpatient procedure. An open biopsy is also a more traumatic procedure. It involves greater tissue trauma, more blood loss and a higher risk of complications such as hematoma, infection and pathologic fracture. If a tourniquet is used there is always a fear that the oozing from tumor after the tourniquet is released may contaminate large areas of the limb. All this makes an open biopsy a less forgiving procedure and a correct technique is of utmost importance if limb salvage is considered. The skin removed at final procedure is more and may compromise closure during salvage surgery. In contradistinction to fine-needle aspiration biopsy, large gauge percutaneous cutting-needle or core-needle biopsy yields solid specimens that are amenable to histologic analysis. Multiple samples can be obtained from the same puncture site by slightly changing the angle of approach (Fig. 6). Core biopsy is especially helpful in difficult areas, such as the spine, pelvis and hips. Here it can be done image intensifier guided or CT guided. Percutaneous biopsy of bone offers several advantages compared with open procedures. The methods are simple and economical; the biopsy can be done as an outpatient procedure, saving the time and extent of hospitalization. With the current impetus towards cost containment, core needle biopsy offers major savings compared with open biopsy. Healing of a wound is not endangered and thus, treatment with radiation and chemotherapy can be started appropriately. The opportunities of limb salvage are improved, since there is less disruption of soft tissue and fascial planes. There is less risk of increased stress risers and pathological fractures. The rate of complications has been less than 1% in most series [5-7]. Needle biopsies can reach deep areas of the skeleton that are otherwise accessible only by open operation and multiple specimens can be obtained without increasing morbidity. When a needle biopsy is non-diagnostic, it can easily be repeated, or an open biopsy can be performed without major morbidity to the patient. It does however require a skilled and experienced pathologist to reach an accurate diagnosis from the small sample of tissue. This may be possible only in specialized centers. What is the accuracy of a needle biopsy ? The diagnostic accuracy for trucut biopsy for soft tissue tumours approaches 96% [6,7] The diagnostic accuracy reported in literature for closed bone biopsy of bone tumors is about 80%  In our experience, histopathological diagnosis was obtained in 89% patients . The specimen was non-representative in 11% patients. 96.9% patients who had a confirmed final diagnosis had an accurate diagnosis from the J needle biopsy. Pohlig et al  reported equivalent sensitivity and specificity between needle core and open biopsies of bone.Adams et al  reported only a 3% major error rate in the histological diagnosis with a needle biopsy and concluded that office-based core needle biopsy for malignant musculoskeletal neoplasms had high diagnostic and accuracy rates. We reported a 79% diagnostic yield and 95% accuracy with CT guided biopsy of deep seated musculoskeletal lesions.. Rimondi et al in large series of 2027 cases over 18 years reported similar results with CT guided biopsies. Kiatisevi et al in 2013 reported similar accuracy between incisional biopsy and CT guided core needle biopsy for musculoskeletal lesions. We can therefore conclude that a needle biopsy today offers the same chance of giving a correct diagnosis as an open biopsy. Who should do the biopsy ? In an era of open biopsies, the surgeons would do all the biopsies. When FNAC was the predominant needle biopsy, pathologists did the biopsies. In the current era, where needle core biopsies are done, particularly with image guidance, interventional radiologists are doing a large number of biopsies. Irrespective of who does the biopsy, tremendous cooperation and teamwork is necessary to ensure correct placement and technique. The biopsy is always done in consultation with the surgeon who will be deciding the final management. This is ideal as the site is chosen correctly and biopsy done in a manner not to compromise the final limb salvage procedure. A good habit is to mark the line of incision before sending the patient to the radiologist. Any surgeon not experienced in managing tumors, should resist the temptation of doing a biopsy himself unless he is familiar with the limb salvage procedures. As alluded to earlier, Mankin’s article points out that even in advanced centres in the west, biopsy related complications have often been the cause of an unnecessary amputation . The rate of these complications is higher when the biopsy is done at centres not specialized in oncology . Open biopsies, because of the inherent risk of complications, should only be done in specialized tumor centers under the supervision of the team that will perform the limb salvage procedure. What is the correct site ? Regardless of the type of biopsy it’s placement is critical. For appropriate placement of the biopsy, the surgeon needs to know the probable diagnosis and the extent of the tumor and should have established an operative plan prior to biopsy. He should not be concerned only with obtaining a tissue diagnosis but should also think about the definitive operative procedure. Transverse incisions in the extremities are almost always contraindicated because the site of the incision cannot be excised en bloc with the longitudinally directed segments of bone or musculo- aponeurotic compartments. Therefore, a longitudinal biopsy incision must always be used in the extremity. The major neurovascular structures should be avoided because if they are contaminated during the biopsy they may have to be sacrificed during the definitive procedure that follows. The biopsy tract also should not traverse a normal anatomical musculoskeletal compartment in order to reach a compartment that is involved by tumor, so that it will not be necessary to remove both compartments at the time of the definitive procedure. It is best to violate only one compartment. The joint should never be violated; attention to this is important especially around the knee. As a rule no biopsy should be done through the joint or arthroscopic for any aggressive tumor. Standard operative approaches employed in orthopaedic procedures may prove inappropriate for a biopsy. As an example, biopsy of the humerus through the deltopectoral interval causes dissemination of tumor cells at a distance through normal neurovascular planes. It would be more appropriate to biopsy the tumor through the anterior deltoid (Fig. 8) so as to contain the hematoma and then to resect en bloc the biopsy-contaminated deltoid with the humerus during the definitive procedure. Similarly, an anterior midline approach is not the preferred approach for knee tumours. We prefer either a medial or lateral approach as we usually preserve the rectus femoris (Fig. 9). The recommended sites are given in the table 1. We wish to point out that these recommendations are based on the currently used limb salvage procedures by us. The final decision is of course that of the surgeon going to do the final procedure. What part of the tumor should be biopsied ? Sarcomas grow centripetally and therefore have viable cells in the periphery. The centres of many rapidly growing tumors are necrotic. The best material for diagnosis is therefore from the periphery. Biopsy from the soft tissue component of a bone tumor is as representative as that from the bone and does not risk a fracture. Obviously ossified or calcified tissue should be avoided as these areas are paucicellular. Lytic areas provide the most representative tissue. Image guidance with a c-arm or CT scan is often useful when imaging points to the most suitable region to biopsy. This is most important for a needle biopsy where the maximum number of errors are due to wrong targeting. What needle to use ? To biopsy a soft mass we use the tru-cut needle-biopsy system consisting of a cannulated needle with an inner trocar that contains a specimen notch. We use a spring loaded system to reduce crushing artifacts and pain. The trucut needle mounts onto a spring loaded gun.(Fig. 13) Alternatively, disposable single use spring loaded guns for core biopsy are commercially available. (Fig. 14) For obtaining cores from bone we use the Jamshidi needle which consists of an outer cannula and an inner trocar. (Fig. 15) A stylet to remove the cores from the cannula completes the set. The needle is sharp enough to penetrate metaphyseal bone. For the spine a coaxial bone needle like the cook’s needle is used(Fig. 16). Generally 2-3 cores are adequate. A trucut biopsy is done after infiltrating skin with local anaesthetic. Too much infiltration can increase the area of contamination. The needle is advanced till it enters the tumor. The trigger is released and the needle withdrawn to obtain the core. For bone the Jamshidi needle is advanced through the stab incision until the trocar touches the bone. With rotatory motion the outer cortex is pierced and the trocar is withdrawn. The cannula is further introduced into the bone and rotated to core out the tissue. The cannula is withdrawn and the core removed from the cannula using a stylet. The trocar is replaced in the cannula and the procedure repeated from the same puncture site by slightly changing the angle of approach. The needle should penetrate different areas of the tumor from the same point of entry by changing the angle of approach.(Fig. 17) Sarcomas are often heterogenous; some areas appear low grade whereas some may be very high grade. Often necrotic areas are present and there may be areas of dedifferentiation. Sampling multiple areas can thus reduce the errors. After adequate cores are obtained (we usually take three), the wound is closed using a single skin suture. In general, the procedure is well tolerated with local anaesthesia. In our experience, in no patient did we fail to complete the procedure for any reason. During an incisional biopsy attention to technical details is important for high specimen quality and reduced tumor spread. It is emphasized that the biopsy is a very important step in the evaluation of musculoskeletal lesions and that it requires careful planning and execution as in any surgery. Biopsy is not to be regarded as a simple minor procedure. Close attention to asepsis, skin preparation, hemostasis, wound closure is necessary to minimize complications. 2. No flaps should be raised. One should cut directly into the tumor. This reduces contamination and minimizes tissue loss at final surgery. 3. The periphery of any malignant tumor is its most viable, representative and diagnostic portion, whereas the central portion is often necrotic. 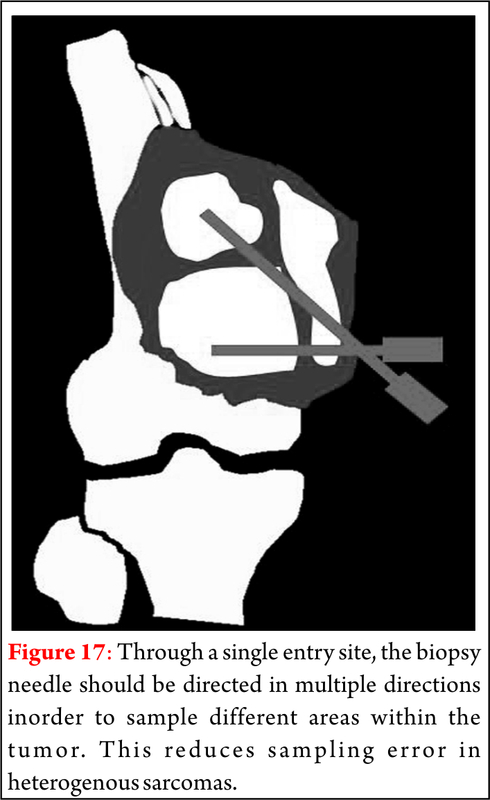 The area of the Codman triangle should be avoided because of the risk that the reactive bone will be interpreted as an osteosarcoma . It is not necessary to biopsy the bone containing a malignant bone tumor unless there is no soft tissue extension. Violating the cortex of a bone that contains malignant tumour may lead to pathological fracture. If the bone must be opened a small circular hole should be made with a trephine, so that only minimum stress-risers are created . 4. Meticulous hemostasis is necessary so that substantial post-operative hematoma is prevented. If a hole has been created in the bone, it should be plugged with Gelfoam or methylmethaacrylate to prevent bleeding into the soft tissues. 5. Be certain that an adequate amount of representative tissue is obtained and that the pathologist prepares the slides in a manner that will allow a definitive diagnosis. 6. Biopsy site must be closed carefully to prevent tissue necrosis and minimise contamination. 7. Suction drains should not be used if malignant disease is likely, as the drainage tube tract can be a site for tumor spread and will have to be excised en bloc with the biopsy site. If a drain must be used, the tract should be adjacent to and in line with the biopsy incision. Drain exiting away from incision means more contaminated skin and more excision at time of resection. 1. Ensure that the material was adequate and representative. 2. No diagnosis does not always mean a failed biopsy. In lesions like UBC it can rule out other differential diagnoses. 3. In a needle biopsy the diagnosis is not often “confident” or complete. If the diagnosis is consistent with the clinico-radiologic picture then treatment can be started immediately. e.g , a diagnosis of a sarcoma without clear osteoid is consistent with a diagnosis of an osteosarcoma in a 15year old child with a classical xray picture. 4. If the pathologist cannot make a diagnosis because of unfamiliarity with bone and soft-tissue tumors, urge him/her to seek consultation promptly. 5. If the diagnosis does not match the clinico-radiologic picture then the pathologist should be asked to review the diagnosis. If necessary one can repeat the biopsy or do an open biopsy. 1. If the orthopaedist or the institution is not equipped to perform accurate diagnostic studies or definitive surgery and adjunctive treatment, the patient should be referred to a treating center prior to performance of the biopsy. 2. All the material collected at biopsy should be processed at one place. It is a bad idea to divide the material and send it to different pathology laboratories. Due to the heterogenous nature of many sarcomas this can lead to different reports and more confusion. For any discrepancy, it is better to seek a second opinion on the same material by sending slides and blocks. 3. The pathologist should be provided with all the clinical and imaging information. Without this background the diagnosis can be seriously wrong. 4. If the needle biopsy yields only fluid or blood an FNAC can be done to establish the diagnosis. 5. Beware of heterogenous or dedifferentiated tumors. A needle biopsy may sample only one area and give an incorrect diagnosis. The dedifferentiated component may not be sampled or only a low grade area may be sampled from a tumor which is otherwise high grade. The biopsy should be done only after appropriate and adequate imaging. It should ideally be done at a specialised centre by the team which will perform the final procedure. A Needle biopsy is safer but requires a skilled pathologist for interpretation. A clinico-radiologic correlation is necessary for final pathologic diagnosis and calls for co-ordination between the surgeon, radiologist and the pathologist. Additional diagnostic tools like immunohistochemistry and cytogenetics can aid differential diagnosis. The surgical principles and technique should be meticulously adhered to failing which an unnecessary amputation may result. Before doing a biopsy think. After reading a biopsy report, think again..
2. Jaffe HL: Introduction: Problems of Classification and Diagnosis. In Jaffe HL (ed). Tumors and Tumourous Conditions of the Bones and Joints. Philadelphia, Lea and Febiger 9-17, 1958. 3. Enneking WF: The issue of the biopsy [editorial]. J Bone Joint Surg 64-A: 1119-1120 1982. 9. Pohlig F, Kirchhoff C, Lenze U, Schauwecker J, Burgkart R, Rechl H, von Eisenhart-Rothe R. Percutaneous core needle biopsy versus open biopsy in diagnostics of bone and soft tissue sarcoma: a retrospective study. European journal of medical research. 2012 Nov 1;17(1):1. 10. Adams SC, Potter BK, Pitcher DJ, Temple HT. Office-based core needle biopsy of bone and soft tissue malignancies: an accurate alternative to open biopsy with infrequent complications. Clinical Orthopaedics and Related Research®. 2010 Oct 1;468(10):2774-80. 11. Puri A, Shingade VU, Agarwal MG, Anchan C, Juvekar S, Desai S, Jambhekar NA. 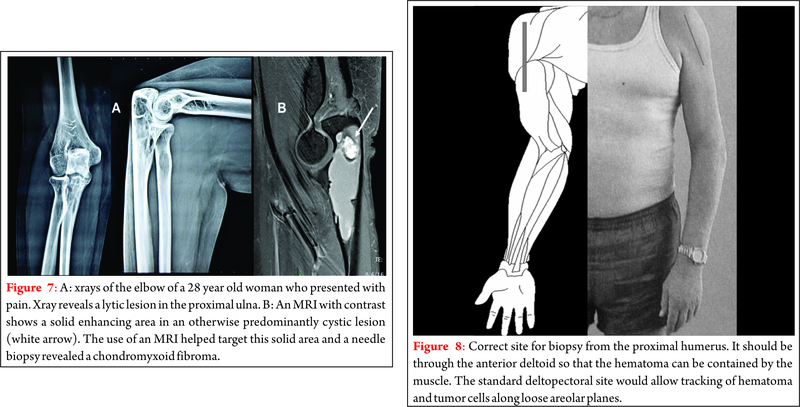 CT–guided percutaneous core needle biopsy in deep seated musculoskeletal lesions: a prospective study of 128 cases. Skeletal radiology. 2006 Mar 1;35(3):138-43. 12. Rimondi E, Rossi G, Bartalena T, Ciminari R, Alberghini M, Ruggieri P, Errani C, Angelini A, Calabrò T, Abati CN, Balladelli A. Percutaneous CT-guided biopsy of the musculoskeletal system: results of 2027 cases. European journal of radiology. 2011 Jan 31;77(1):34-42. 13. Kiatisevi P, Thanakit V, Sukunthanak B, Boonthatip M, Bumrungchart S, Witoonchart K. Computed tomography–guided core needle biopsy versus incisional biopsy in diagnosing musculoskeletal lesions. Journal of Orthopaedic Surgery. 2013;21(2). How to Cite this article: Agarwal M. Biopsy for Musculoskeletal Tumors – An Orthopaedic Surgeons Guide. Journal of Clinical Orthopaedics July – Dec 2016; 1(1):21-28.